Izzy, I knew you were going to be our DJ from our first conversation!, Your energy came right through the phone. Thank you for continuing with that energy and great personality for our special day. He was one of the best DJ's we ever heard! Fun and knew his music!" "You were fantastic. You had all the kids involved - dancing and participating in the games. The music was a perfect mix. Thank you for making Jack's party a success!" Everyone commented that they had never been to a wedding that the dance floor was continuously jumping, even during dinner (which is what the bride wanted) People loved that the DJ was out on the dance floor participating and getting the crowd involved. He was very courteous, Polite and had a continuous smiling face and fuel of energy. Izzy, Just a note to say a big thanks for getting me "Eddie" as my DJ for the Feb 25th Party, we loved him, he was great !, and yes you can recommend him. The people had a blast, especially when he did the trivia!! !, please send me his e-mail so that I may thank him also!. Gracias, For two years running my husbands employer ( KB Electronics in Coral Springs, Fl.) has trusted you With the entertainment portion of their Annual Company party and with good reason. The company employees encompasses a wide variety of cultures and ages, and the incredible music collection and your wisdom to " put it all tog	ether" if you will, makes an otherwise boring bland event into an absolute blast ! If you look closely (as I was) Everyone- All ages and cultures got to enjoy themselves. They have only you to thank for that Mr. Del Campo. 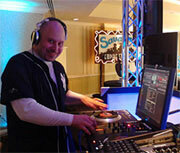 Excellent Service, Terrific DJ Personality, Wonderful all around. "My family and friends had so much fun - we would have danced ALL NIGHT!! Thank you for making our family feel so special!! 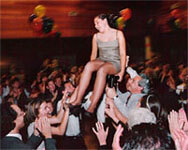 We are the #1 source for Ft.Lauderdale Disc Jockeys and MC's, Uplighting, Photo Booths, Photography, Videography, etc. your one stop shop for Event Services. We offer Ft.Lauderdale Mobile Entertainment for all occasions and Specialize in Weddings, Mitzvahs, Quinces, Sweet 16's, or any formal event where only the best will do. 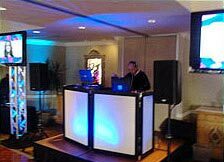 We also feature: Christian Wedding DJ's, and Christian DJ's for Anniversaries, Birthday Parties, School Events, Corporate Picnics, DJ/GamesMaster Combo's, Karaoke DJ's, and High Energy Interactive MC's that can bring your party to life. Our Experienced party planners provide the highest quality of service, yes! " we are #1" in the industry because we really care about you and making your special day a memorable one. We take the time to meet with you and discus your needs in detail, then we meticulously Plan the Event Itinerary and program the music Prior to arrival so that everything is exactly the way you dreamed it would be on your special day. We customize the music to fit the tastes of you and your guests, and the mood of your event. We also provide you with new technology to help you organize all the details and pick and store your favorite songs from our website online databas<e helping us to custom the music styles to your specific taste . Our multilingual MC's will make everyone feel welcome. We offer the latest in modern high Wattage Up-lighting fixtures, and can make the Walls and ceilings of your event glow any color you choose to match your theme, it will make the room look so beautiful you will think you died and went to heaven, Up lighting is the most inexpensive investment you can make to create such a big impact on the look and feel of your venue, Up lighting will make any room look glamorous. We offer Packages that Include professional Photography and Video taping services so you can deal with one company for all your entertainment needs. *Over 17,000 Music selections and growing. with online library to choose from all styles all clean edits from 1930 to now! *Online Credit Card payments accepted. *Online timeline planner 24/7 save it for up to one year! * Dunk Tanks * Celebrity Impersonators Etc.